For a couple of days, thunderstorms have rumbled all around us, keeping us from our next destination some 50 miles to the north. 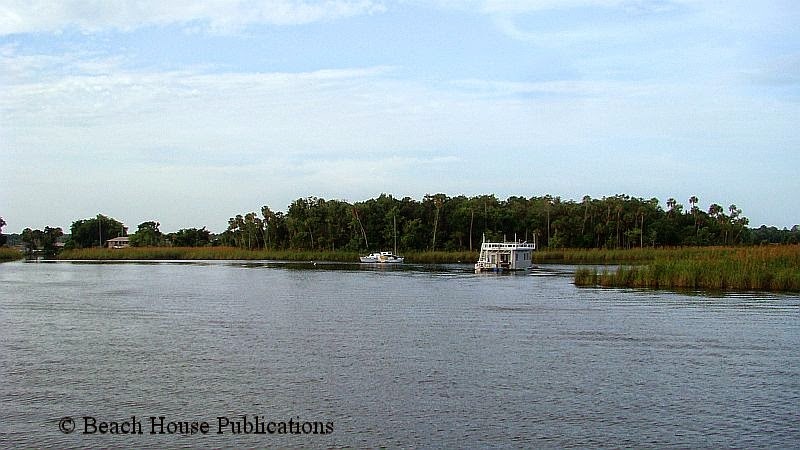 This isn't like the protected waterway; this time we need to cross the Gulf of Mexico from Steinhatchee to St. Marks. "How did you get to Steinhatchee, you were just in Fort Myers," you might ask? That's a good question and one we ask ourselves. The time seems to be flying by and we are covering a lot of ground, err, water. Up until a week ago, the weather was cooperating, the boat was running just fine after the repairs and all was right with the world. After Fort Myers, there were days when we only traveled 10 to 15 miles along the waterway. But that was by design. Once the engine repairs were done and appeared to be fine, we began the research of the Gulf Coast anchorages for the next book. This is always the fun part. Our process is pretty simple. We pick the areas we want to investigate the day before, cruise the approach and anchorage areas, making notes of depths for the approach, depths inside the anchorage, latitude and longitude, bottom types, wind and wave protection and dinghy landing places ashore. All of this is recorded in our log so that the info can be added to the book. Our stop for that first evening, but by no means our first anchorage to check, was in Pelican Bay at Cayo Costa State Park. We shared the anchorage with 16 other boats. 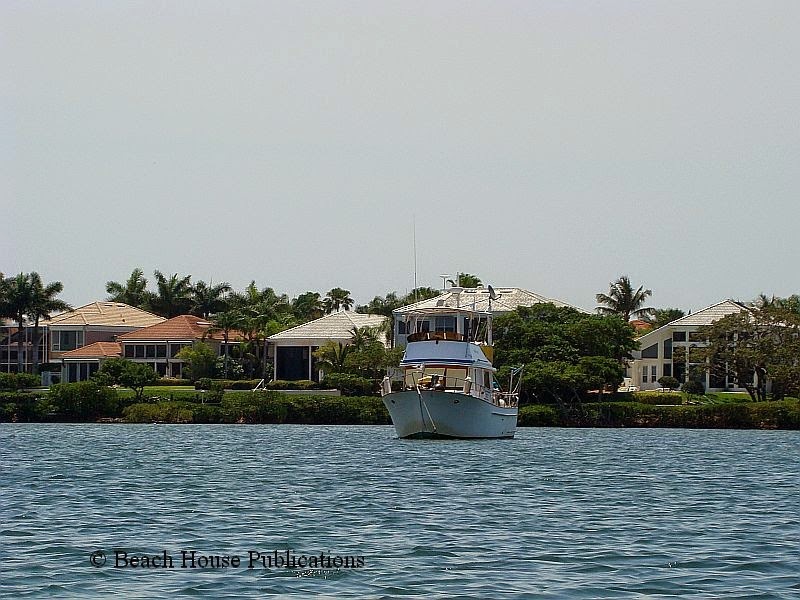 From Pelican Bay on, it became a blur of anchorages and free docks for what seemed like days. Beach House and crew made stops in Englewood Beach and Longboat Key. At Longboat we had a good visit with our friends that had kindly given us the use of their dock in Key Biscayne before we crossed to the Bahamas last year. 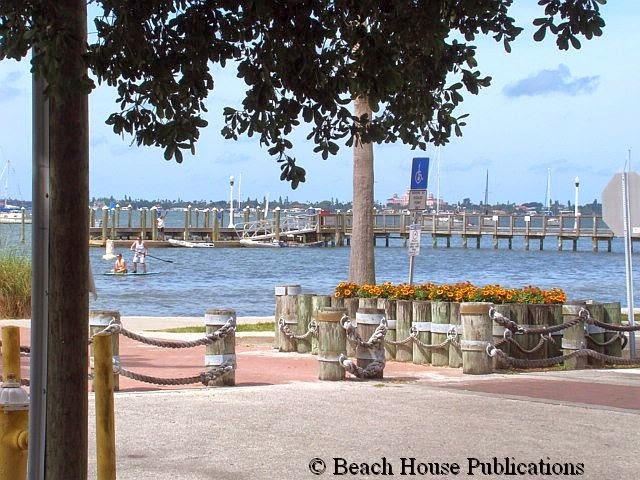 From Longboat Key, after many, many more anchorage spots, we arrived on the Manatee River and spent some time in Bradenton. 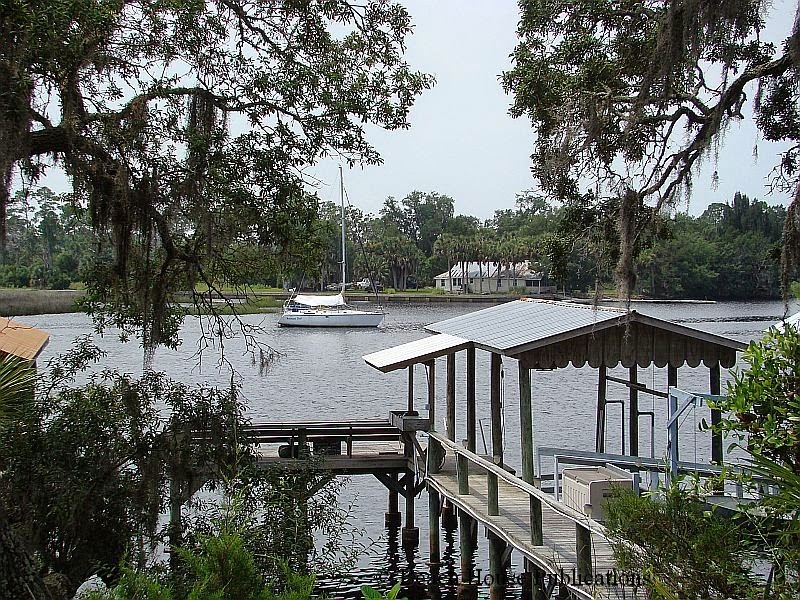 We anchored in the river, took advantage of the Bradenton free day dock to explore the city and spent a quiet and peaceful night in Terra Ceia Bay the next night. From there, Beach House and crew visited St. Petersburg and spent time in the city marina. Our first night on a mooring in Vinoy Basin was probably the most uncomfortable night since our anchorage at Highbourne in the Bahamas. Swells and waves worked into the basin from Tampa Bay and bounced off the surrounding seawalls, creating a very uncomfortable roll. The next day we moved into a marina slip so we could enjoy all that downtown St. Petersburg has to offer, as well as visiting with a former cruising buddy. Anchoring or mooring here in easterly winds is just not an option. The next few days would find us in Gulfport. The funky beach side atmosphere we found made the stop in Gulfport a real treat. The downtown area is filled with quaint shops and some excellent restaurants. On Tuesday, there is a farmer market in the downtown area with many vendors. The anchorage off Gulfport is very large with many boats. It's exposed to weather and boat wakes, but there is a very nice floating dinghy dock inside the pier right in downtown. If a marina stop is required or desired, the Municipal Marina has a friendly staff and is well protected if bad weather is pending. It's only a short walk from the marina to downtown, about a mile. 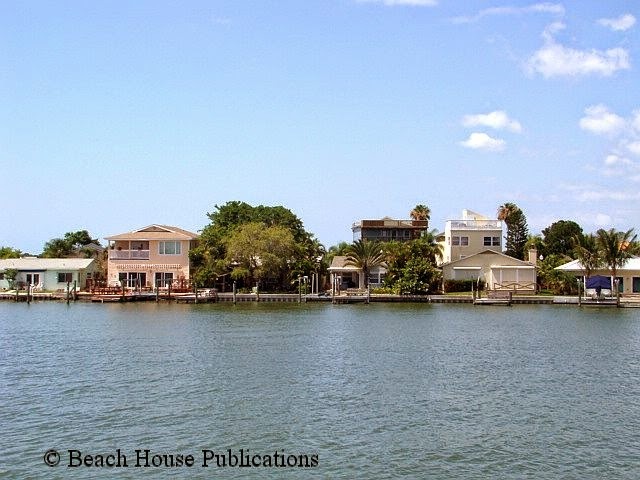 From Gulfport, we needed to do some very extensive research of Boca Ciega Bay. This would prove to be quite an undertaking since there are so many options for anchorages. The entire bay is a fabulous cruising ground and one could spend a week or more just in this area. After anchoring for the night in Redington Shores, we then moved on to the Clearwater area. There's a great day dock just across from the beach that can be utilized until midnight. Then, just drop back across the channel and anchor. One particularly memorable location in this area was Caladesi State Park. The remote island is only accessible by boat and the protected marina basin offers relatively inexpensive slips with power available. Deeper draft boats might want to bypass Caladesi since the approach channel can be quite shallow at low tide (4 feet). The next day took us to the town of Tarpon Springs. 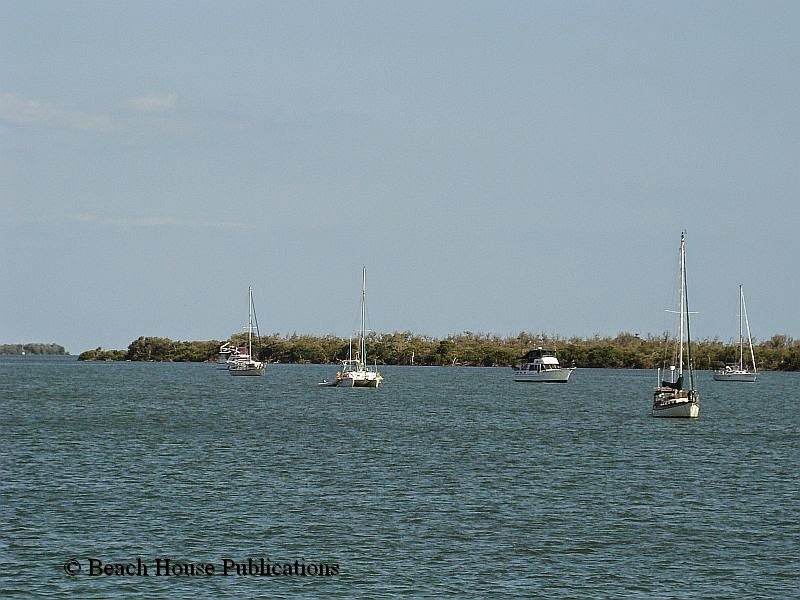 The only available anchorages are at Anclote Key and near the boat ramp and power plant at the entrance to the Anclote River. Farther upriver toward town, the water outside the channel is very shallow. 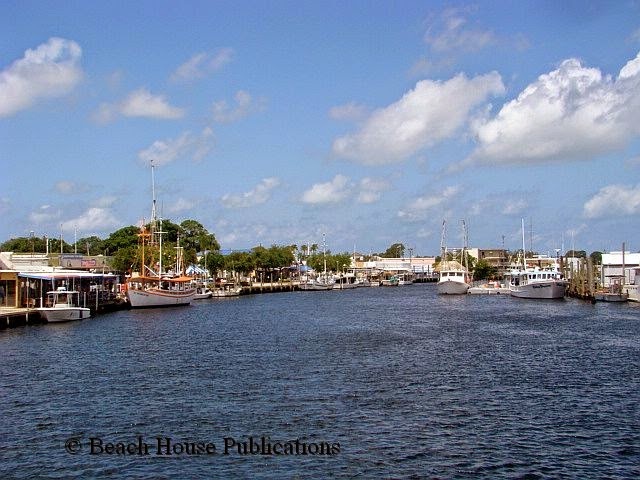 Tarpon Springs does have several marinas so that boaters can visit the town and experience the Greek cuisine Tarpon Springs is famous for and visit the working sponging community. Maybe it was just the time of year, but on our visit we found very little activity in town, and the place seemed to be a little tired since our last visit several years ago. Leaving Tarpon Springs and heading north meant a jump out into the Gulf of Mexico to our next destination on the Crystal River. Weather now became very important in crossing the open Gulf. From past experience, we know all too well how even moderate conditions can create very uncomfortable conditions for a long trawler passage. Our departure from Tarpon Springs at first light brought us the 70 miles to Kings Bay on the Crystal River by 3:30 in the afternoon. The crossing was excellent and the well-marked but winding channel into Crystal River made our arrival stress free and very pleasant. We planned to spend a week to visit relatives and take care of some doctors appointment that had been made months in advance. Our car was nearby for us to use, and the location just made everything convenient. It was good to just be in one place for a while and not have to move on. With our own transportation we shopped, visited family, explored and did all the things that are hard to do from a cruising boat while underway. Exploring Crystal River was fun, too, since this isn't a common cruising destination, although in our opinion it should be. Getting off the beaten path is our favorite thing to do. From Crystal River, our next port of call was also off the well worn path. The Withlacoochee River was another 32 miles away by the time we went back down river, cross the Florida Barge Canal Channel and went up the Withlacoochee. This turned out to be one of our favorite places so far. The entire Big Bend area of Florida is not what most expect when visiting Florida. 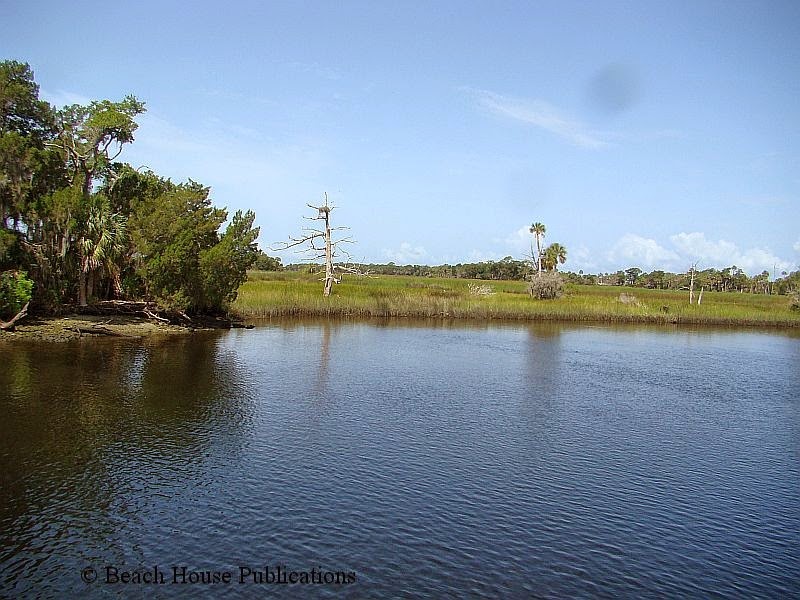 Locals refer to the area as "Old Florida" and with good reason. There are no major condo developments and no amusement parks, just small fishing towns without all the big crowds and high prices. The laid back atmosphere only adds to the natural beauty that seems to have been lost in much of the rest of the state. 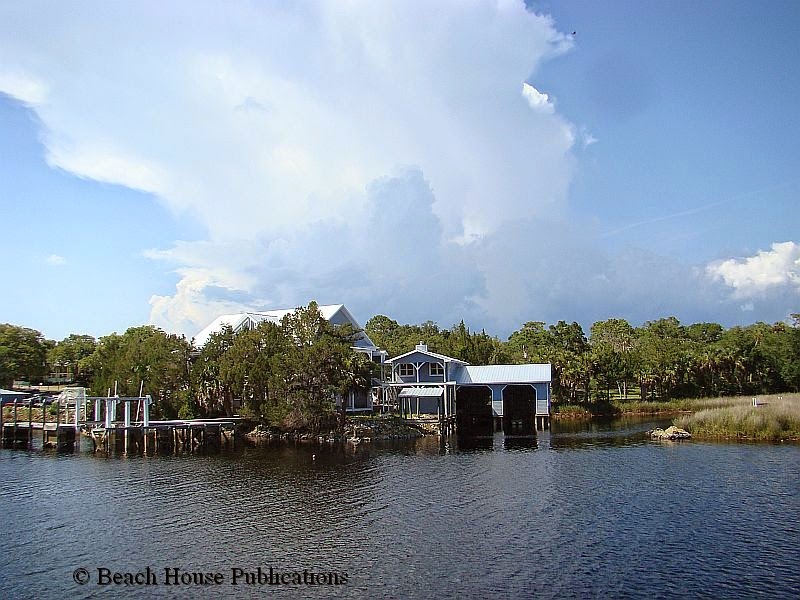 Beach House stayed at Riverside Marina in Yankeetown for almost another week and could have stayed much longer. The sheer beauty of the area both on the water and on land makes this one of the most peaceful places we have had the pleasure of visiting. Our relatives helped us pick up and move our car from Crystal River to the Withlacoochee, again, making getting around easy. Even though we had spent almost two weeks in this area, it went by too fast. Once again, we needed to move on. The trip from the Withlacoochee River to Steinhatchee was our longest distance covered, 80 miles, in a very long time. This was all new territory for us since our last passage along this coast was done on our sailboat with a 6-foot draft. We wrongly believed that these rivers were too shallow to transit in a boat of that draft. Now we know that is just not correct and we could have done this trip with Sea Trek. All of the approach channels are far out into the Gulf, but all are well-marked and deep enough to allow the commercial shrimp boats to come and go as they please. Only a very few places would have given us any pause, even with a 6-foot draft, and with the exception of the 5-foot bar at the Crystal River entrance, would not have kept us out of the other rivers, even at low tide. We departed the Withlacoochee at 6:10 a.m. and dropped our hook in Steinhatchee at 4:30 p.m. after another very nice Gulf crossing. So far we had avoided the typical afternoon thunderstorms that are notorious this time of year. On recent passages along the Gulf Coast we had experienced very violent weather and now try hard to avoid that if at all possible. From the Steinhatchee, the plan is to head to St. Marks and begin exploration of the Florida panhandle and Alabama.